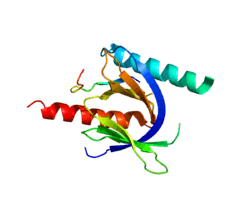 Integrin beta-1 also known as CD29 is a protein that in humans is encoded by the ITGB1 gene. CD29 is an integrin unit associated with very late antigen receptors. It is known to conjoin with alpha-3 subunit to create α3β1 complex that reacts to such molecules as netrin-1 and reelin. In cardiac muscle and skeletal muscle, the integrin beta-1D isoform is specifically expressed, and localizes to costameres, where it aids in the lateral force transmission from the Z-discs to the extracellular matrix. Abnormal levels of integrin beta-1D have been found in limb girdle muscular dystrophy and polyneuropathy. ↑ Goodfellow PJ, Nevanlinna HA, Gorman P, Sheer D, Lam G, Goodfellow PN (Jan 1989). "Assignment of the gene encoding the beta-subunit of the human fibronectin receptor (beta-FNR) to chromosome 10p11.2". Annals of Human Genetics. 53 (Pt 1): 15–22. doi:10.1111/j.1469-1809.1989.tb01118.x. PMID 2524991. ↑ "Entrez Gene: ITGB1 integrin, beta 1 (fibronectin receptor, beta polypeptide, antigen CD29 includes MDF2, MSK12)". 1 2 3 Hynes RO (Apr 1992). "Integrins: versatility, modulation, and signaling in cell adhesion". Cell. 69 (1): 11–25. doi:10.1016/0092-8674(92)90115-s. PMID 1555235. 1 2 Sastry SK, Horwitz AF (Oct 1993). "Integrin cytoplasmic domains: mediators of cytoskeletal linkages and extra- and intracellular initiated transmembrane signaling". Current Opinion in Cell Biology. 5 (5): 819–31. doi:10.1016/0955-0674(93)90031-k. PMID 8240826. ↑ Burridge K, Chrzanowska-Wodnicka M (1996). "Focal adhesions, contractility, and signaling". Annual Review of Cell and Developmental Biology. 12: 463–518. doi:10.1146/annurev.cellbio.12.1.463. PMID 8970735. ↑ Schwartz MA, Schaller MD, Ginsberg MH (1995). "Integrins: emerging paradigms of signal transduction". Annual Review of Cell and Developmental Biology. 11: 549–99. doi:10.1146/annurev.cb.11.110195.003001. PMID 8689569. ↑ LaFlamme SE, Akiyama SK, Yamada KM (Apr 1992). "Regulation of fibronectin receptor distribution". The Journal of Cell Biology. 117 (2): 437–47. doi:10.1083/jcb.117.2.437. PMID 1373145. ↑ Akiyama SK, Yamada SS, Yamada KM, LaFlamme SE (Jun 1994). "Transmembrane signal transduction by integrin cytoplasmic domains expressed in single-subunit chimeras". The Journal of Biological Chemistry. 269 (23): 15961–4. PMID 7515874. ↑ Reszka AA, Hayashi Y, Horwitz AF (Jun 1992). "Identification of amino acid sequences in the integrin beta 1 cytoplasmic domain implicated in cytoskeletal association". The Journal of Cell Biology. 117 (6): 1321–30. doi:10.1083/jcb.117.6.1321. PMID 1376731. ↑ Altruda F, Cervella P, Tarone G, Botta C, Balzac F, Stefanuto G, Silengo L (Nov 1990). "A human integrin beta 1 subunit with a unique cytoplasmic domain generated by alternative mRNA processing". Gene. 95 (2): 261–6. doi:10.1016/0378-1119(90)90369-3. PMID 2249781. ↑ Balzac F, Retta SF, Albini A, Melchiorri A, Koteliansky VE, Geuna M, Silengo L, Tarone G (Oct 1994). "Expression of beta 1B integrin isoform in CHO cells results in a dominant negative effect on cell adhesion and motility". The Journal of Cell Biology. 127 (2): 557–65. doi:10.1083/jcb.127.2.557. PMID 7523423. ↑ Languino LR, Ruoslahti E (Apr 1992). "An alternative form of the integrin beta 1 subunit with a variant cytoplasmic domain". The Journal of Biological Chemistry. 267 (10): 7116–20. PMID 1551917. ↑ Meredith J, Takada Y, Fornaro M, Languino LR, Schwartz MA (Sep 1995). "Inhibition of cell cycle progression by the alternatively spliced integrin beta 1C". Science. 269 (5230): 1570–2. doi:10.1126/science.7545312. PMID 7545312. ↑ Zhidkova NI, Belkin AM, Mayne R (Sep 1995). "Novel isoform of beta 1 integrin expressed in skeletal and cardiac muscle". Biochemical and Biophysical Research Communications. 214 (1): 279–85. doi:10.1006/bbrc.1995.2285. PMID 7545396. 1 2 van der Flier A, Kuikman I, Baudoin C, van der Neut R, Sonnenberg A (Aug 1995). "A novel beta 1 integrin isoform produced by alternative splicing: unique expression in cardiac and skeletal muscle". FEBS Letters. 369 (2-3): 340–4. doi:10.1016/0014-5793(95)00814-p. PMID 7544298. 1 2 Belkin AM, Zhidkova NI, Balzac F, Altruda F, Tomatis D, Maier A, Tarone G, Koteliansky VE, Burridge K (Jan 1996). "Beta 1D integrin displaces the beta 1A isoform in striated muscles: localization at junctional structures and signaling potential in nonmuscle cells". The Journal of Cell Biology. 132 (1-2): 211–26. doi:10.1083/jcb.132.1.211. PMID 8567725. ↑ Anastasi G, Cutroneo G, Trimarchi F, Santoro G, Bruschetta D, Bramanti P, Pisani A, Favaloro A (Dec 2004). "Evaluation of sarcoglycans, vinculin-talin-integrin system and filamin2 in alpha- and gamma-sarcoglycanopathy: an immunohistochemical study". International Journal of Molecular Medicine. 14 (6): 989–99. PMID 15547664. ↑ Anastasi G, Cutroneo G, Santoro G, Arco A, Rizzo G, Bramanti P, Rinaldi C, Sidoti A, Amato A, Favaloro A (Sep 2008). "Costameric proteins in human skeletal muscle during muscular inactivity". Journal of Anatomy. 213 (3): 284–95. doi:10.1111/j.1469-7580.2008.00921.x. PMID 18537849. ↑ Otey CA, Pavalko FM, Burridge K (Aug 1990). "An interaction between alpha-actinin and the beta 1 integrin subunit in vitro". The Journal of Cell Biology. 111 (2): 721–9. doi:10.1083/jcb.111.2.721. PMC 2116186 . PMID 2116421. ↑ Otey CA, Vasquez GB, Burridge K, Erickson BW (Oct 1993). "Mapping of the alpha-actinin binding site within the beta 1 integrin cytoplasmic domain". The Journal of Biological Chemistry. 268 (28): 21193–7. PMID 7691808. ↑ Lozahic S, Christiansen D, Manié S, Gerlier D, Billard M, Boucheix C, Rubinstein E (Mar 2000). "CD46 (membrane cofactor protein) associates with multiple beta1 integrins and tetraspans". European Journal of Immunology. 30 (3): 900–7. doi:10.1002/1521-4141(200003)30:3<900::AID-IMMU900>3.0.CO;2-X. PMID 10741407. ↑ Radford KJ, Thorne RF, Hersey P (May 1996). "CD63 associates with transmembrane 4 superfamily members, CD9 and CD81, and with beta 1 integrins in human melanoma". Biochemical and Biophysical Research Communications. 222 (1): 13–8. doi:10.1006/bbrc.1996.0690. PMID 8630057. 1 2 Mazzocca A, Carloni V, Sciammetta S, Cordella C, Pantaleo P, Caldini A, Gentilini P, Pinzani M (Sep 2002). "Expression of transmembrane 4 superfamily (TM4SF) proteins and their role in hepatic stellate cell motility and wound healing migration". Journal of Hepatology. 37 (3): 322–30. doi:10.1016/S0168-8278(02)00175-7. PMID 12175627. ↑ Wixler V, Geerts D, Laplantine E, Westhoff D, Smyth N, Aumailley M, Sonnenberg A, Paulsson M (Oct 2000). "The LIM-only protein DRAL/FHL2 binds to the cytoplasmic domain of several alpha and beta integrin chains and is recruited to adhesion complexes". The Journal of Biological Chemistry. 275 (43): 33669–78. doi:10.1074/jbc.M002519200. PMID 10906324. 1 2 van der Flier A, Kuikman I, Kramer D, Geerts D, Kreft M, Takafuta T, Shapiro SS, Sonnenberg A (Jan 2002). "Different splice variants of filamin-B affect myogenesis, subcellular distribution, and determine binding to integrin [beta] subunits". The Journal of Cell Biology. 156 (2): 361–76. doi:10.1083/jcb.200103037. PMC 2199218 . PMID 11807098. ↑ Loo DT, Kanner SB, Aruffo A (Sep 1998). "Filamin binds to the cytoplasmic domain of the beta1-integrin. Identification of amino acids responsible for this interaction". The Journal of Biological Chemistry. 273 (36): 23304–12. doi:10.1074/jbc.273.36.23304. PMID 9722563. ↑ Serru V, Le Naour F, Billard M, Azorsa DO, Lanza F, Boucheix C, Rubinstein E (May 1999). "Selective tetraspan-integrin complexes (CD81/alpha4beta1, CD151/alpha3beta1, CD151/alpha6beta1) under conditions disrupting tetraspan interactions". The Biochemical Journal. 340 (Pt 1): 103–11. doi:10.1042/0264-6021:3400103. PMC 1220227 . PMID 10229664. 1 2 Lee HS, Millward-Sadler SJ, Wright MO, Nuki G, Al-Jamal R, Salter DM (Nov 2002). "Activation of Integrin-RACK1/PKCalpha signalling in human articular chondrocyte mechanotransduction". Osteoarthritis and Cartilage / OARS, Osteoarthritis Research Society. 10 (11): 890–7. doi:10.1053/joca.2002.0842. PMID 12435334. ↑ Liliental J, Chang DD (Jan 1998). "Rack1, a receptor for activated protein kinase C, interacts with integrin beta subunit". The Journal of Biological Chemistry. 273 (4): 2379–83. doi:10.1074/jbc.273.4.2379. PMID 9442085. ↑ Chang DD, Wong C, Smith H, Liu J (Sep 1997). "ICAP-1, a novel beta1 integrin cytoplasmic domain-associated protein, binds to a conserved and functionally important NPXY sequence motif of beta1 integrin". The Journal of Cell Biology. 138 (5): 1149–57. doi:10.1083/jcb.138.5.1149. PMC 2136751 . PMID 9281591. ↑ Chang DD, Hoang BQ, Liu J, Springer TA (Mar 2002). "Molecular basis for interaction between Icap1 alpha PTB domain and beta 1 integrin". The Journal of Biological Chemistry. 277 (10): 8140–5. doi:10.1074/jbc.M109031200. PMID 11741908. ↑ Hadari YR, Arbel-Goren R, Levy Y, Amsterdam A, Alon R, Zakut R, Zick Y (Jul 2000). "Galectin-8 binding to integrins inhibits cell adhesion and induces apoptosis". Journal of Cell Science. 113 (13): 2385–97. PMID 10852818. ↑ Poinat P, De Arcangelis A, Sookhareea S, Zhu X, Hedgecock EM, Labouesse M, Georges-Labouesse E (Apr 2002). "A conserved interaction between beta1 integrin/PAT-3 and Nck-interacting kinase/MIG-15 that mediates commissural axon navigation in C. elegans". Current Biology. 12 (8): 622–31. doi:10.1016/S0960-9822(02)00764-9. PMID 11967148. ↑ Fournier HN, Dupé-Manet S, Bouvard D, Lacombe ML, Marie C, Block MR, Albiges-Rizo C (Jun 2002). "Integrin cytoplasmic domain-associated protein 1alpha (ICAP-1alpha ) interacts directly with the metastasis suppressor nm23-H2, and both proteins are targeted to newly formed cell adhesion sites upon integrin engagement". The Journal of Biological Chemistry. 277 (23): 20895–902. doi:10.1074/jbc.M200200200. PMID 11919189. ↑ Parsons M, Keppler MD, Kline A, Messent A, Humphries MJ, Gilchrist R, Hart IR, Quittau-Prevostel C, Hughes WE, Parker PJ, Ng T (Aug 2002). "Site-directed perturbation of protein kinase C- integrin interaction blocks carcinoma cell chemotaxis". Molecular and Cellular Biology. 22 (16): 5897–911. doi:10.1128/MCB.22.16.5897-5911.2002. PMC 133968 . PMID 12138200. ↑ Tapley P, Horwitz A, Buck C, Duggan K, Rohrschneider L (Mar 1989). "Integrins isolated from Rous sarcoma virus-transformed chicken embryo fibroblasts". Oncogene. 4 (3): 325–33. PMID 2468126. ↑ Horwitz A, Duggan K, Buck C, Beckerle MC, Burridge K (1986). "Interaction of plasma membrane fibronectin receptor with talin--a transmembrane linkage". Nature. 320 (6062): 531–3. doi:10.1038/320531a0. PMID 2938015. ↑ Tachibana I, Bodorova J, Berditchevski F, Zutter MM, Hemler ME (Nov 1997). "NAG-2, a novel transmembrane-4 superfamily (TM4SF) protein that complexes with integrins and other TM4SF proteins". The Journal of Biological Chemistry. 272 (46): 29181–9. doi:10.1074/jbc.272.46.29181. PMID 9360996. ↑ Han DC, Rodriguez LG, Guan JL (Jan 2001). "Identification of a novel interaction between integrin beta1 and 14-3-3beta". Oncogene. 20 (3): 346–57. doi:10.1038/sj.onc.1204068. PMID 11313964.